Vicky Bullen,CEO of Coley Porter Bell wrote an interesting piece on the Union Jack where she looked at its use in branding and a poll on how consumers feel about it. If you look at international flags there are some rudimentary schema through which they are arranged. For instance, many flags follow France with a tricolore schema with three equal vertical strips, others with three horizontal bands. Some flags have a central unifying area to which the eye is drawn – Japan, Korea and Brazil would be prime examples. Other flags create schema that compartmentalize information like the Stars and Stripes. Some flags have a central line and an isosceles triangle off left, South Africa, for example – there is an off-kilter messiness to these which is not really compensated for by visual complexity and involvement. I hope I do not come across as a chauvinist but the Union Jack does complexity and dynamism in spades. What the Union Jack does brilliantly is to simultaneously combine symmetry, or at least balance, with an interesting tension. Involving a series of intersecting lines, it has both a centrifugal and a centripetal force to it. It forms a rough schematic and is segmented into four sections but at the same time these are cohesive. This connotes both segmentation and a central axis of unity. In a sense this is visual metaphor for the reality of the Act of Union, an uneasy co-existence of identity shards. A comedian recently said that it is a country no-one really wants to be part of. The English are phlegmatic, the Welsh simmering with resentment and the Scots positively contemptuous. Only half of Northern Ireland cares about the Union and that is only really to piss off the Irish Republicans in their midst. The Union Jack is one of the few flags that seems to disrupt its own bounds. It aspires to break through its borders and even out of the 2D flat plane, creating a sense of outward protrusion and impact. It is brilliantly centrifugal and this combines with depth of field because the diagonals are layered underneath the cross to make it a much more engrossing semiotic phenomenon than most other flags – those, for example, which direct your eye to a single symbol, divide the plane up into three equal orthogonal segments or are partitioned into stripes and carve out a special corner zone. All of this means that the Union Jack (or Union Flag, to give it its proper title before I vex vexillologists out there and you start to correct me) has high semantic density. “The semantic density of something is the measure of how much information it conveys in relation to its size or duration. The higher the semantic density, or the more semantically dense something is, the more information it packs into the given space or time.” (Andy Bradbury, Neurolinguistic Programming). I always like to give the examples of an average Indian street sensorially – semantically dense – also I like to think that Japanese culture is probably the most semantically dense on Earth. If you were to download the whole of Japanese culture into a digital file (with Tokyo’s dizzying annual output of magazines, films, music and books) it would be very heavy! Without wanting to get too technical, there are different types of semantic density, pertaining to the way meaning pools on, say, a 2D frame. The litmus test is what will distort the meaning. Sometimes meaning is condensed in a cultural symbol, (symbolic density) sometimes distributed in the schema, as with the tessellations of Islamic architecture – schematic density. Sometimes meaning is distributed through the entire visual field. Where some flags have one density type, the Union Jack seems to be finely poised between density types, keeping the eye busy flipping between them. The flag hints at schematic density via indexes of the diagonals pointing like arrows whilst also imbuing the flag with transgression through breaking framing of the flag (a mereological density), through spilling over the cordon which most flags respect. It is also a flag brilliant suited to inflection, which brands have only just started to see the potential of. Both Innocent and Sainsbury’s have seen the explosive potential of the Union Jack to render their messages more dynamic and seemingly youthful in their thrust. To be fair, this sense of explosive potential has always lurked latent in the Union Jack and is definitely one of the reasons it has become both a counter-cultural and a xenophobic symbol. 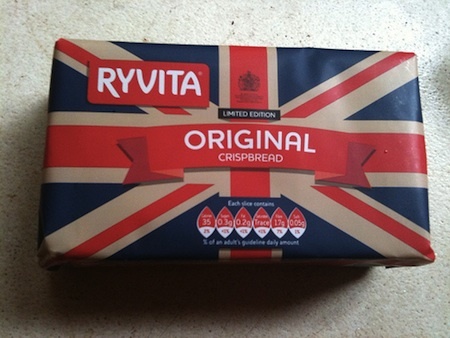 At the same time brands like Ryvita can, in this fetching limited edition pack, exploit the wrapping, ribbon-like qualities of the flag. The closest parallel to this uptake of the national flag is that of the humble Canadian maple leaf – which becomes much less humble in the hockey team logo context! The Union Jack has almost gone the reverse route – becoming more homely as required. Bullen notes the flexibility of the Union Jack (whichever fraction of the flag used it is instantly recognizable) and its iconic density – it is a flag easily inflected and sampled from, which is also true of the Maple Leaf. As a nation we’re not as comfortable with the flag yet as Canadians are with their flag. There is antipathy towards some of the Union Jacks’ anachronistic connotations while the Maple Leaf was crowd sourced in a national competition so is more indigenous. Even so, it is worth exulting in the Union Jack’s inventive design if nothing else.